Portland State University is working with Barnes & Noble Education LoudCloud to co-develop a degree planning solution that will help students chart a path to graduation. The project is part of the university's strategic goals to "improve the student experience through digital services innovation" and improve degree completion, according to a news announcement. It's also enabled by PSU's participation in the Frontier Set, a group of 29 U.S. higher education institutions and state systems "committed to significantly increasing student access and success, and eliminating racial/ethnic and socioeconomic disparities in college attainment." The Frontier Set was convened earlier this year by the Bill & Melinda Gates Foundation in partnership with Association of Public and Land Grant Universities and other supporting organizations. Increasing degree completion, particularly for disadvantaged students, "is a problem worth solving to benefit millions of students across the country and stems from our extensive research and design thinking work to revamp advising," said Sukhwant Jhaj, PSU's vice provost for innovation, planning and student success, in a statement. "Our institutions and the higher education ecosystem can do more to help the new non-traditional majority. We can minimize silos that send students running around campus. And we can create more transparency with costs and financial aid. We are excited to partner with BNED LoudCloud because of their eagerness to tackle the challenges students face, particularly around academic and financial planning, and how their analytics expertise can improve degree planning. This degree planning platform will be transformational in helping students save time, save money and reduce stress." The new degree planning tool will allow students to set long-term goals, track progress toward graduation, understand financial aid options, navigate pathways to employment and more. BNED LoudCloud analytics will "provide students with insights based on their academic context/performance and career goals, so that they can work with advisers to identify degree paths that will maximize their chance of success," the announcement said. 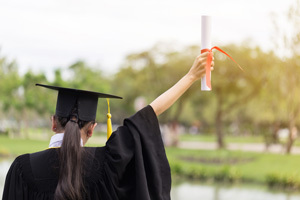 "This partnership lays the foundations for degree planner to tackle a number of student challenges, such as how to link degree paths to an ever-changing job market and how to provide a clear credit-taking path from community colleges to universities," said Kanuj Malhotra, chief operating officer at BNED Digital Education, in a statement. "And more broadly, our degree planning solution will enhance our institutional analytics to help partners enrich student-adviser interactions and tackle the challenges around demand planning. We are thrilled to partner with PSU on this forward-thinking initiative." "This is a much-needed personalized advising tool for our students that not only puts each one on a direct path to a degree but also supports them in tracking the progress of their major, grades, financial aid and other vital information," added Jhaj. "Over time, this tool will help bolster PSU's retention and graduation rates and ultimately will reduce costs for students by enabling them to stay on a more efficient course to graduate."